It's been a real joy to see the Mego/Editions Mego empire going from strength to strength in recent months. It wasn't too long since the original Mego label lay dormant; once a colossus within the European avant-garde community and one of the key institutions in the shaping of how we define modern computer music, only to suddenly vanish. Well, the label has since been reborn and currently enjoys a blistering display of form. This mini LP underlines that perfectly, bringing together contemporary innovators Florian Hecker, Russell Haswell and Mika Vainio for a look back at the pioneering ambient works of Popol Vuh, one of the great bands of the krautrock era and regular collaborators with filmmaker Werner Herzog. Excerpts from their soundtrack to Aguirre, The Wrath Of God are used in the Haswell & Hecker re-composition featured here, which finds the synthetic choral ambience of the 1972 original respectfully warped and devoured by the advanced machinations of these two titans in the field of cutting edge electronics. Plumes of digital tone rupture the warmth and surface tension established by the source material, arcing and pitchshifting with extravagant, fluid trajectories, and ultimately casting a beautiful algorithmic scrawl over the original. 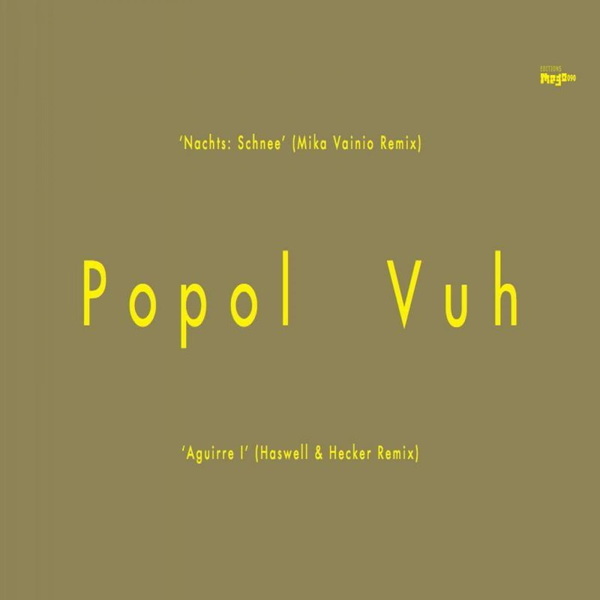 Mika Vainio's reworking of 'Nachts: Schnee' is equally successful, distilling a profound, frost-coated ambience reminiscent of the auditory deep-freeze of Thomas Koner's chilliest productions. Vainio's subtle, textured modulations sculpt some sort of narrative order, but without sabotaging the overwhelming sense of stillness that presides over the composition. Two indispensable sides of bright red vinyl, all but guaranteed to bewitch any follower of experimental electronic music, both old and new. A massive recommendation.